At the start of September, we were staring down the barrel of another long, grey winter in London, so had enough foresight to book one last summer holiday. This time we were going back to the Med with our favourite sailing company, Medsailors, for a week long loop around the Greek islands, leaving from Athens. We flew into Athens on a Thursday, arriving around 10pm. This is much earlier than we are used to getting into places (usually arrive around midnight if it is an after work flight from London), so instead of taking the smart, quick option of taxiing to the hotel, we decided to catch a bus. Big mistake. A journey that should have taken us less than half an hour in a taxi turned into a two hour ordeal, after it was impossible to buy tickets and missing the first bus, finally getting on and then realising there were about 100 stops between the airport and our hotel, then being driven at snails pace. We finally made it to the hotel around midnight to find we had booked an exceptionally budget place – this took retro to another level. I don’t think this place had been renovated (apart from the lobby) in over 40 years. It was not pleasant. But it was convenient to the marina our boat would be leaving from on Saturday. In the morning, we decided to head into central Athens for a spot of sightseeing. The receptionist recommended heading to a kiosk along the road to buy the tram tickets as the ticket machines at the stations didn’t work. So off down the road we headed – unfortunately nothing that resembled a kiosk sold tickets at all – they all looked at us like we were crazy when we asked. We then tried the machines at the station. A nice Dutch family was having similar struggles with the machines not working, so we decided to walk along to the next station to see if we had any luck there. We did not. Someone had helpfully glued the coin slot in the machine shut so it was impossible to use. We kept walking along to the next station and FINALLY were able to get the machine to give us tickets. It definitely lived up to what we were expecting from Greece. What we were not expecting lay in central Athens when we finally were able to make it there. After everything you see on TV regarding the issues Greece is having financially, the last thing I thought we would find was a vibrant city which clearly was evolving, changing and had a lot of new investment (albiet, generally on a small scale). The number of amazing little restaurants and bars that we passed was incredible. And so began the best culinary experience of our travels to date. The temperature was rapidly increasing, so we knew there would be a definite limit on the amount of time we would be able to spend wandering around in the sun, so decided to head up to the Acropolis first. This has to be one of the most iconic tourist attractions in Europe, along with the Eiffel Tower in Paris and the Colosseum in Rome. I think what makes this one so magical is the prime position on the hill, central to basically everything in Athens. We found a very cute back streets way up the hill which meandered through cute little houses with colourful bougainvillea strung across the cobbled streets. At the Acropolis we came across the most cliché tourist that made you cringe with every word that came out of their mouth. She was initially complaining that you had to walk up the stairs to get to the top rather than being able to catch an escalator or lift, then when she saw the entry fee exclaimed “who the hell would pay €20 to see a pile of old rocks?”. She was one of those people who you can’t believe ever bothered to leave the comfort of their own home to fly half way round the world and be grumpy about everything they were encountering. After sweltering up the top of the hill for long enough, we descended and met up with our friends in a bar just below the Acropolis. That evening we went to one of the best food places I have ever been on holiday – Cinque Wine and Deli Bar. Both of our groups of friends who we met up with had never been introduced before, but they had both been the night before already and were ready to make a repeat trip. The wine bar is tucked away down a little alley that looks a little dodgy as you are walking through. The bar itself is tiny, so it is imperative that you book. We were lucky as we got there early and were able to sit at a table for an hour before the organised people arrived. The cutest couple run the bar and you can just tell how passionate they are about exceptional quality Greek food and wine. Initially, the wife will ask you what type of wine you would like to drink then bring you out a number of tasters to try before you settle on the one to drink. They only serve Greek wine and are very passionate about the origins of the wine and educating you about it. The husband makes the most intricate, delicious, perfect cheese/meat platters. They take him a long time to put together, but it just shows how much he cares about the food he puts together. I was so impressed by the service, food and wine here that when we returned to Athens a week later, this was number one on my must do list. After a week of sailing, we returned to Athens for two more nights before heading off to Santorini. We were staying in a much better location this time around where we didn’t have to use the tram… however, since there were four of us heading into the city after the boat trip, we decided to catch a taxi. Not the greatest idea. We had been told not to catch the taxis at the marina as they rip you off, so we walked down the road a bit and flagged one down. We were all exhausted from the boat trip and we forgot to ask the taxi driver how much it would cost to get into town. He seized this opportunity and ended up charging us €40 when it should have cost around €10. He was a piece of work. We kind of knew straight away that he was going to rip us off as he only disclosed the price once we were driving down the road. He then tried to get us to book him as our private taxi driver for the next 2 days, showing us a lot of photos of the All Black Ma’a Nonu and his family who he had allegedly taken on the same trip earlier that year. I mean, come on mate, we know you are ripping us off, why do you think we will book you after that? Surely you would offer a cheaper price initially so you could gain the more lucrative business later. So annoying. During our wanders around the city, we found a great little souvlaki shop, Mikro Politiko in the middle of Athens that made up a large proportion of our meals over the next couple of days as this was very central, cheap, convenient and delicious. This food is such good value for money as you get a pretty decent snack for €2.50 without having to bother with the whole table service thing – genius use of time while travelling. We found it as we were walking down the street in central Athens, feeling particularly ravenous, and spotted a group of people with delicious looking souvlaki, so just asked them where they got it from. Great way to find good food – keep your eyes peeled. 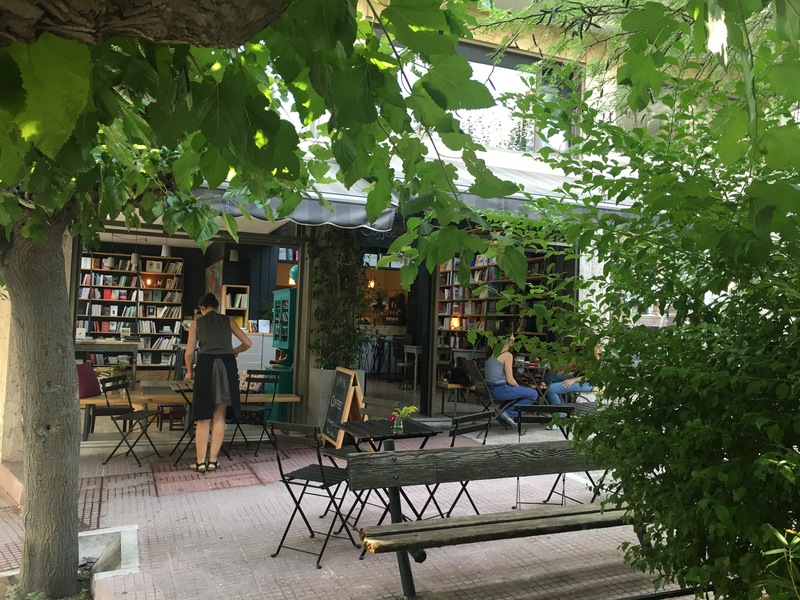 Near our hotel we also stumbled across a real little gem – Little Tree Books and Coffee. This was a book shop / coffee shop / wine bar. All of my favourite things combined together. We stopped here for breakfast and had an amazing freddo espresso (one of the best coffee drinks for hot temperatures – hits all the coffee and cold drink cravings at once), and a grilled tomato, basil and cheese sandwich. At night we returned when it had morphed into a wine bar. With our wine came the best bar snack I have ever come across (not a hard feat as most places serve mixed nuts which I cannot eat). They bought out a little bowl with carrot and cucumber sticks, cherry tomatoes and olives, with a tiny sprinkling of rock salt and olive brine. Absolutely perfect. You also were able to sit outside in a little courtyard that you could still people watch from but were not right by the road. I would highly recommend anyone travelling to Athens to visit this place. The remainder of our time in Athens was just hanging out with friends who were dotted across the city after the boat trip. We visited a number of roof top bars with spectacular views of the Acropolis. The majority of these were atop hotels but were easy enough to go to even if you were not staying at the hotel. It was one of our friends birthday while we were there so we took her back to the Cinque Wine Bar to celebrate. They even served her a ‘birthday cake’ which was a circle slice of watermelon topped with crumbled feta and balsamic drizzle with a little candle. It was as if they could just tell exactly what she would like as this was the perfect cake for her. I have heard really mixed things about Athens, but I really enjoyed the time that we spent there. Yes, once you have been to the Acropolis there is not that much to see/do, but the food scene is fantastic, it is hot, sunny, and a little bit more interesting because of the gritty nature of the city.